Copyright: © 2017 Schuster B, et al. This is an open-access article distributed under the terms of the Creative Commons Attribution License, which permits unrestricted use, distribution, and reproduction in any medium, provided the original author and source are credited. Background: Distal epiphyseal injuries of the tibia in growing children are usually classified according to the classification of Salter Harris into 5 types, but if the physis is not injured, the Salter-Harris-classification does not apply; instead the Ogden classification can be used. Findings: We report the case of a distal epiphyseal avulsion fracture of the tibiofibular junction, classified as Ogden VII injury. Conclusions: A CT scan performed in intraepiphyseal avulsion fractures of the tibia to classify it correctly. The Salter-Harris classification cannot be applied for epiphyseal avulsion fractures, which do not traverse the physis. Conservative management is possible. Fractures of the epiphysis account for 4% of ankle fractures. 10 to 25% of epiphyseal fractures are localized at the ankle region [1,2]. The majority of avulsion fractures of the distal tibiofibular ligament occur during sports, especially with jumps. If the physis is open, the Salter-Harris classification can be applied to classify growth plate injuries. With partial osseous closure of the physis transitional fractures like the juvenile Tillaux fracture  and triplane fracture,  occur. Epiphyseal avulsion fractures of the distal tibial epiphysis without disruption of the physis are very rare. To the best of our knowledge, only one case series described two forms of this type of fracture . These fractures are classified according to the Ogden classification . A CT scan is applied to establish the correct diagnosis. 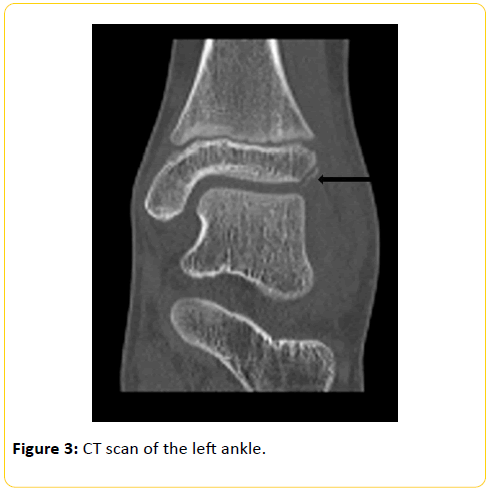 The CT-scan provides information regarding a possible injury to the tibiofibular junction and if the articulation in the distal tibiofibular joint remained intact and thus provides information about the extent of displacement of the fracture. To plan for the management of these injuries, Salter Harris III fractures and Ogden VII injuries are classified into undisplaced (fracture gap and displacement <2 mm) and displaced fractures (fracture gap ≥ 2.0 mm). For conservative treatment, a lower leg or Sarmiento cast is applied and weight bearing is discouraged for 4 to 6 weeks, depending on the patient’s age. In contrast to a Salter Harris type III epiphyseal fracture, the Ogden VII fracture does not involve a fracture gap traversing the growth plate. The patient, a twelve-year-old boy, sustained the injury when playing badminton. He suffered from acute pain in the ankle joint and swelling of the left distal tibiofibular syndesmosis area. We noted no neurovascular alteration of the leg. Plain X-ray images revealed an intraepiphyseal osteochondral fragment not afflicting the distal physis of the tibia (Figure 1). We suspected an avulsion fracture of the distal tibial epiphysis. To confirm the assumption, we ordered a CT scan of the left ankle (Figures 2 and 3). The distal tibia and fibula articulated properly, the physis was not affected by the fracture. Figure 1: Distal physis of the tibia X-ray image. Figure 2: CT scan of the left ankle. Figure 3: CT scan of the left ankle. We measured a width of the fracture gap of 1 mm. The articulation of the tibia and fibula in the distal tibiofibular joint was not altered; therefore, we chose a non-operative treatment approach. We applied a lower leg cast and discouraged weight bearing for 4 weeks. After removal of the cast, we encouraged the patient to bear weight and applied a Vacoped® (Oped, Valley, Germany) walking device for 2 weeks. Four weeks after the injury plain ankle X-ray studies demonstrated union of the fracture (Figure 4). We noted unrestricted range of motion of the ankle joint 6 weeks after the injury. 12 months after the injury, the patient participated in sport without experiencing any pain. 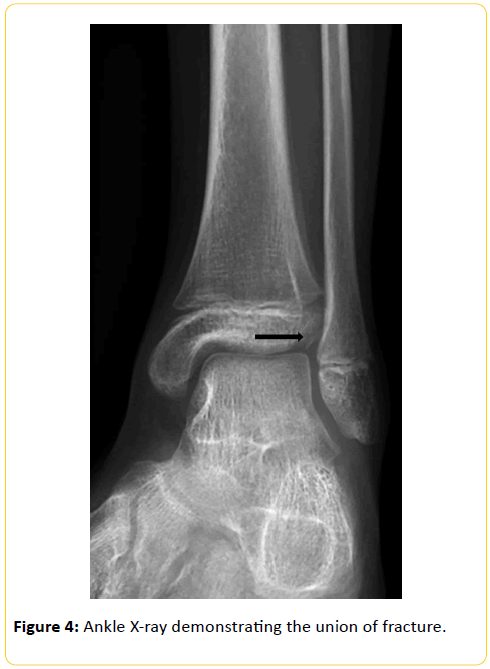 Figure 4: Ankle X-ray demonstrating the union of fracture. With the exception of juvenile Tillaux fracture, and lateral triplane fracture, authors have not paid particular attention to injuries of the tibiofibular syndesmosis in children. 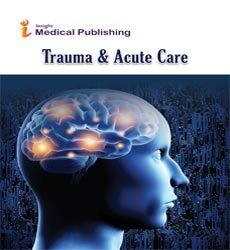 A recent Cochrane review by Yeung et al. on the topic of ankle fractures in children found only poor quality of evidence for the diagnosis and treatment due to lack of studies . Bozic et al. described the normal radiographic appearance of the distal tibial epiphysis at the region of the tibiofibular syndesmosis using plain X-ray mortise view images . To the best of our knowledge there is only one case series describing intra-epiphyseal fractures of Chaput’s tubercle (Ogden-type 7A and 7B fractures) and intraepiphyseal subcortical tibial fracture with tibiofibular mortise disruption . In that series only one of four fractures was noted at plain X-ray images of the ankle, the others were identified using CT scan images. Maeda et al. 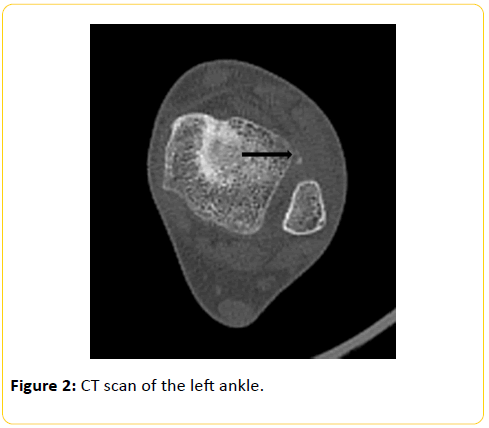 describe the use of sonography to diagnose chondral avulsion fractures of the lateral ankle. However, the examination was performed during a manual anterior drawer stress procedure of the ankle, which might inflict some pain, and yet does not provide information about the tibiofibular joint . We agree with Pesl and Havranek  that for establishing the correct diagnosis in Ogden type VII injuries it is crucial to obtain a CT scan. The differentiation of an Ogden type VII injury from a Salter-Harris III fracture is important. In contrast to Ogden type VII injuries, the fracture line does not cross the physis of the distal tibia in Salter Harris type III injuries (Figure 5). 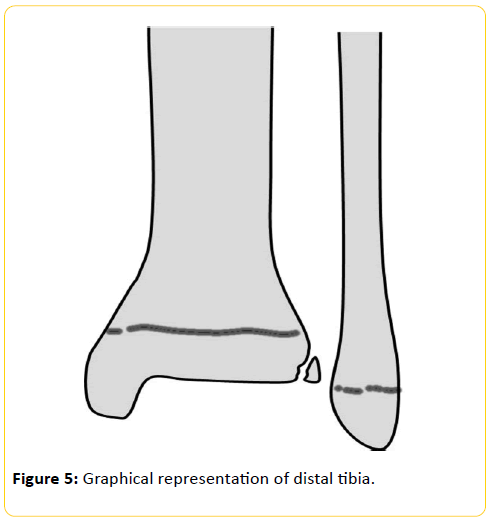 Figure 5: Graphical representation of distal tibia. Salter Harris type III fractures with displacement of the fragment or a fracture gap width of ≥ 2 mm are considered displaced fractures. Correct reduction and stable internal fixation of displaced Salter Harris type III injuries is recommended to prevent bone bridge formation at the distal tibial growth plate. Osseous bridge formation within the growth plate results in premature growth arrest or progressive axial deviation dependent on the extent and location of the bone bridge. A CT scan cannot exclude an injury to the ligaments of the tibiofibular syndesmosis, but if a correct position of fibula in the area of the distal tibiofibular joint is noted, and the fragment is small, an instable tear of the distal tibiofibular syndesmosis is unlikely. As in our patient, in the case series of Pesl and Havranek  these fractures were not complicated by significant displacement and instability of the tibiofibular syndesmosis. All children in their series underwent non-operative treatment with a lower leg cast . Follow up examination showed good results similarly to the outcome we observed in our patient. Although treatment of Ogden type VII fractures did not pose any therapeutic problems or cause long-term functional impairment, it is necessary to bear their appearance and existence in mind, in order not to overlook this rare injury. A CT scan should be performed in intra-epiphyseal avulsion fractures of the tibia to classify it correctly. The Salter-Harrisclassification cannot be applied for epiphyseal avulsion fractures which do not traverse the physis. Conservative management is possible. Landin LA, Danielsson LG, Jonsson K, Pettersson H (1986) Late results in 65 physeal ankle fractures. Acta Orthop Scand. 57: 530–534. Landin LA, Danielsson LG (1983) Children’s ankle fractures. Classification and epidemiology. Acta Orthop Scand. 54: 634–640. Kleiger B, Mankin HJ (1964) Fracture of the lateral protion of the distal tibial epiphysis. J Bone Joint Surg Am. 46: 25–32. Marmor L (1970) An unusual fracture of the tibial epiphysis. Clin Orthop Relat Res. 73: 132–135. Pesl T, Havranek P (2006) Rare injuries to the distal tibiofibular joint in children. Eur J Pediatr Surg. 16: 255–259. Ogden JA (1981) Injury to the growth mechanisms of the immature skeleton. Skeletal Radiol. 6: 237–253. Yeung DE, Jia X, Miller CA, Barker SL (2016) Interventions for treating ankle fractures in children. Cochrane Database of Systematic Reviews. Bozic KJ, Jaramillo D, DiCanzio J, Zurakowski D, Kasser JR (1999) Radiographic appearance of the normal distal tibiofibular syndesmosis in children. J Pediatr Orthop. 19: 14–21. Maeda M, Maeda N, Takaoka T, Tanaka Y (2017) Sonographic Findings of Chondral Avulsion Fractures of the Lateral Ankle Ligaments in Children. J Ultrasound Med. 36: 421–432.